Mixmate Flow is our volumetric based chemical mixing system. It is a low cost way to get started with automated mixing. The Mixmate Flow comes in two basic configurations. The Flow Single uses a single flowmeter with a single valve to give the highest mixing speeds. The Flow Stack uses a single flowmeter with a stack of four valves to mix from three chemical inputs and a rinse water input. The cost per input of the Flow Stack is lower. Compare Mixmate Flow with other manual and automated systems on the market and you will find a combination of features that are not available with any other system. There are a number of very nice manually operated mixing systems on the market that are in the same price range as Mixmate Flow. We want you to compare systems and let us know your preferences. We think automated mixing and automated recordkeeping will tip the balance in favor of Mixmate Flow. Mixmate Flow comes as a simple unit with all of the wiring in place. The assembly is mounted between the water supply tank and the transfer pump. The full flow passes through the manifold and chemicals are mixed directly into the flow. The chemical hoses from the bulk tanks are connected to the inputs. The transfer pump does the work of pumping the chemicals and electric pumps are not needed. Multiple units can be stacked together to add bulk connections. A combination of Flow Singles and Flow Stacks can be used together to match the number of inputs and flow rates needed. Multiple units operate simultaneously to give fast mixing speeds. 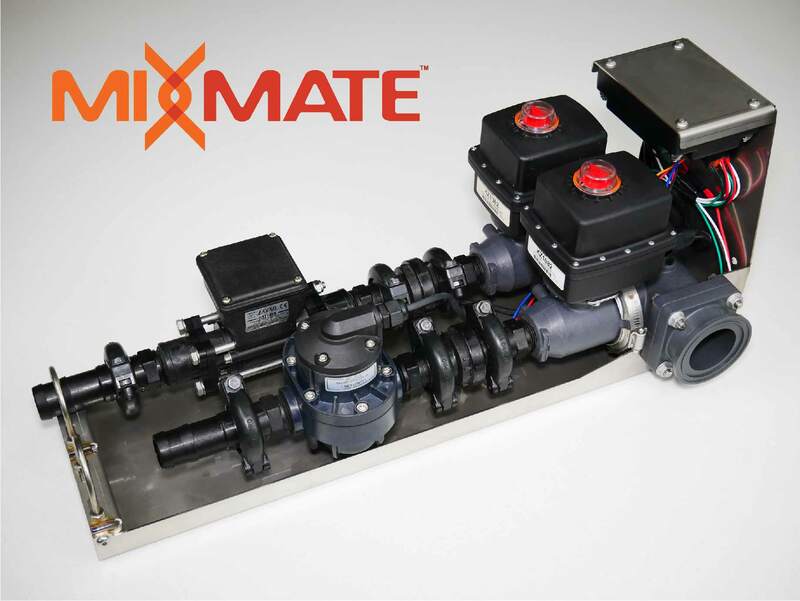 The Mixmate Flow Single utilizes a single one inch valve and flowmeter mounted in a stainless steel frame to simplify mounting and wiring. Multiple units can be mounted together to blend from multiple bulk inputs. All units will mix at the same time. This gives Mixmate the highest speed for mixing bulk chemicals. The chemicals are added to the water flow and diluted immediately to lower the risk of incompatibility. The Flow Single can be fitted with the gear meter or a magmeter. The Mixmate Flow Stack uses four motorized ball valves to sequence three bulk chemicals and water through single flowmeter. The valves, strainer and gear meter or magmeter, and electronics are all mounted in a stainless steel frame. 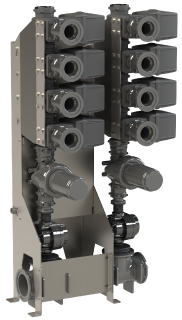 One or two Flow Stacks can be mounted on a frame with up to six bulk chemical inputs. The Flow Stack offers a lower cost per bulk input since fewer flowmeters are used. The Flow Stack sequences the products through the flowmeter and rinses the manifold and flowmeter automatically. The Flow Stack has 1.25 inch valves and a 1 inch gear meter or a 1.25 inch magmeter. Mixmate Flow has several flowmeter options and we prefer to use quality flowmeters that do not require calibration. All of the meters have a +/- 0.5% error rating. The options include magmeters and a positive displacement gear type flowmeter. Generally the gear meter is the best option for most chemicals. The gear meter gives the best combination of value and accuracy for most chemical measurement needs. The gear meter will have a flow range that varies from about 10 gallons per minute for thick chemicals up to about 30 gallons per minute for thin chemicals. A strainer is recommended ahead of the gear meter. A magmeter is a good fit for very thick water based chemicals and fertilizers that need higher flow rates and volumes. Magmeters are available up to three inches in size for mixing large bulk quantities. Flowmeters give the best speed with good accuracy. Most farmers have experience with low-cost battery powered meters and are looking for better options with high accuracy and reliability. Mixmate Flow is a closed system. Chemicals are pumped directly from bulk containers into the spray mix. The closed system gives superior operator safety and simplifies the plumbing on the spray tender trailer. Mixmate Flow is used on the bulk tanks of chemicals. Jugs and dry flowables still need to go through an inductor. The Mixmate Inductor is the best choice, but you can always add features later with a Mixmate system. Mixmate Flow is modular and flexible to fit your needs. You may already have an inductor on your chemical mixing trailer or use the inductor mounted on the sprayer. This keeps the cost down when you can utilize your existing components. The Mixmate App still does all of the calculations for you and you can record the manually measured products along with the products that were measured automatically to create a complete mixing record. Many farmers are already using The Handler, Chembine or Chem-Blade type of mixing system. Mixmate Flow can be used with one of these types of systems to measure and record the bulk chemicals into the mix. The knife system is preferred by some to process the jugs and is a very good option. If you have large amounts of a dry product that does not dissolve well and it needs recirculation in a mixing tank to put it into solution, The Handler or a Chembine may be the best option for this purpose. The Mixmate Inductor works very well with most dry flowables and AMS as well. Many mixing systems take a significant amount of space on the trailer. Space is always a limiting factor on a trailer and Mixmate Flow requires a very small footprint. Mixmate Flow can even be mounted below the trailer deck to free up work space. AGCO reports the national average of 26% of engine hours are spent spraying and 28% of engine hours are spent idling. An improvement to 31% of engine hours spent spraying would lower sprayer operating costs by $0.80 per acre.